at The Cheese and Wine Shop, and choose from our extensive selection. From seasonal favorites such as Bucks Fizz, to new arrivals, theres a box for every occassion. Why not add a bespoke selection, chosen especially for you from our extensive selection; click here to view. Click here to see our full selection, or here for Truffles! Golden Hearts filled with 3 pc of Charbonnels Milk Chocolates, ideal gifts! History ... Founded in 1875, Charbonnel et Walker is one of Britain’s earliest chocolatiers. Encouraged by Edward VII, then the Prince of Wales, the company first formed as a partnership between Mrs Walker and Mme. Charbonnel, the latter from the Maison Boissier chocolate house in Paris. The original shop opened at 173 New Bond Street in Mayfair and has remained in Bond Street ever since. It is now housed in one of London’s elegant arcades, the Royal Arcade on Old Bond Street. Endorsed by the Royal Warrant as chocolate manufacturers to Her Majesty The Queen, Charbonnel et Walker chocolates are hand-made according to traditional recipes. Charbonnel are renowned for our dark chocolate, made from the finest dark couverture, which has a luscious richness and unforgettable silky taste. 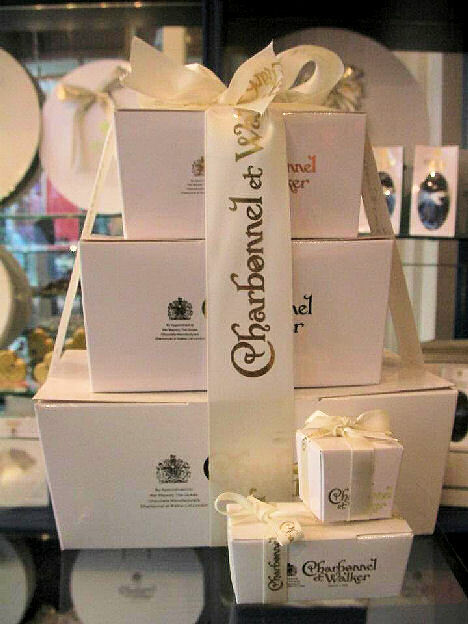 Presented in luxurious hand made boxes, with satin ribbons make a box of Charbonnel the perfect gift for every occasion.